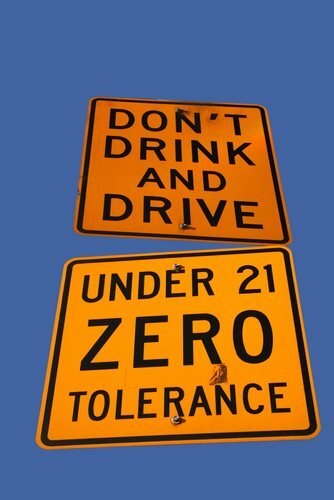 Zero tolerance laws were put into effect to try to deter the number of underage drunk drivers. These laws are adopted by some states and imply certain penalties for people caught driving legally intoxicated, that are under the age of 21. These drivers are not subject to the standard 0.08 Blood Alcohol Content level that exists in all states, but rather a much lower one that varies. Most states use 0.02 as their zero tolerance BAC level, while others fluctuate between 0.00 and 0.01. These zero tolerance laws carry more severe penalties than the normal DUI laws, and can be argued less in court , primarily due to their nature. The rise in alcohol related deaths and accidents led to a push for stricter DUI laws. But when a large number of these deaths proved to be from underage drinkers, a new focus was made. This focus was placed precisely on underage drinking followed by driving, which called for a new set of laws to be made. These laws were known as zero tolerance laws. They are designed to lower the number of drunk drivers by imposing a low BAC level, and stiff penalties for those in violation of them. In essence, they are also aimed at deterring people under the age of 21 to consume alcoholic beverages all together. This would be due to the fact that most teenagers drive constantly, fear of consequences would keep them from drinking. Most of the states that have zero tolerance laws, have parts of these laws that pertain to other areas. These areas can include drugs, and firearms. These zero tolerance laws are used mainly by schools, to show discipline and lack of leniency to the student body for improper behavior. State mandates exist that are set provisions that guide the educational institution in the proper dealing of those found in violation of zero tolerance laws. The universal treatment of anyone violating these laws can help portray the seriousness of the offenses. State mandates have been protested by parents and school officials alike, due to their said lack of focus on individual matters. The addition of zero tolerance laws by certain states was done in direct response to statistics dealing with alcohol related accidents and deaths by underage ( < 21 year old) drivers. Now, after their years of existence and strict enforcement, statistics have gone to help show the positive effect that zero tolerance laws have had on the population. The slight but decreased number of alcohol related accidents due to underage drinking and driving is a clear sign of that. Of course there are still cases where these accidents and deaths occur, but if the numbers are slowly diminishing, perhaps a steady decrease will be imminent. This is if these laws continue to serve their purpose along with other underage drunk driving countermeasures.